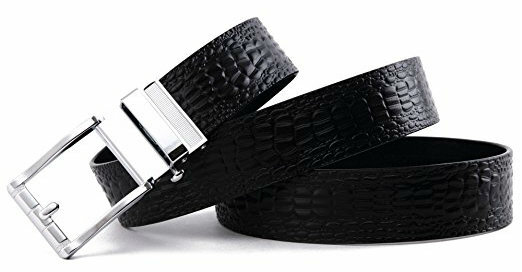 The Kinzd Men’s Leather Ratchet Belt is a new item for the Kinzd lineup and I was excited to have my husband try this belt out as he has needed a new belt for quite sometime. Allen is loving this belt and for many reasons…. but mainly that this belt looks really good with jeans and khakis and is so very versatile. The belt is designed to be trimmed to fit…. so one size fits all. The belt comes with its own puncher as well…. to ensure a perfect fit for all. Check out the pics below to get an idea of the style and how it works. 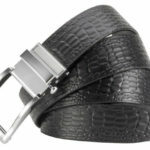 The Kinzd Men’s Leather Ratchet Belt is available in a Black or Brown color and is super easy to use. The belt has no holes! Easy to get on, just slide the belt buckle and pull through to ensure a perfect fit as it locks into place. The belt is super easy to release as you simply press a little lever on the buckles side to release its hold. 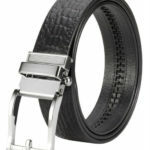 Keep in mind that this belt if beautifully crafted and made of a full grain vegetable tanned leather. The overall look is perfect for a business and leisure look. 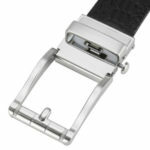 The belt is well made and sturdy and as mentioned above the belt is designed to be trimmed to fit. The belt length is 125cm (excluding the buckle), 35mm (1 3/8 in. ) wide strap, suitable for 28”-46” waist. The 32 position track provides a wide range of size adjustments. the easy to remove buckle allows you to cut the belt to your ideal size to give a primmer and a more tailored appearance. This belt makes an amazing gift as it comes packaged in a gorgeous gift box with a puncher and a storage bag as well. This is perfect for the holidays and as a gift for pretty much any occasion! Make sure you check out the Kinzd website so that you can see all of the fabulous products that they have to offer. This looks like a nice belt!